Awww… two-little-bone wing is actually my preferred wing. I love wings (of both cuts) so, so much. Wings are often the only item on a restaurant menu that is safe(ish) for me to eat, and while I liked them before my diet changed, I love them now. Buffalo Wild Wings is probably my go-to chain restaurant for wings (I get the Salt & Vinegar or Desert Heat seasonings), and there are a couple of local spots that serve up tasty ones, too, although they come with sauce that I’m sure contains some no-no ingredients for me. They haven’t made me sick, so I don’t worry too much. Still, if we buy wings for dinner we are guaranteed to eat less healthfully overall (because you HAVE to get fries, too!) and spend more money, and that goes for eating in or carrying out. But it seemed like too much work to make them at home, and I have failed in the past to achieve a perfect (or even good) wing at home. I spotted a package of chicken wings reduced for quick sale at the store recently, and figured I would try again. I must confess that in the past I didn’t use a recipe (because how hard can it be), and I didn’t know you had to cut them into sections! No wonder I failed. 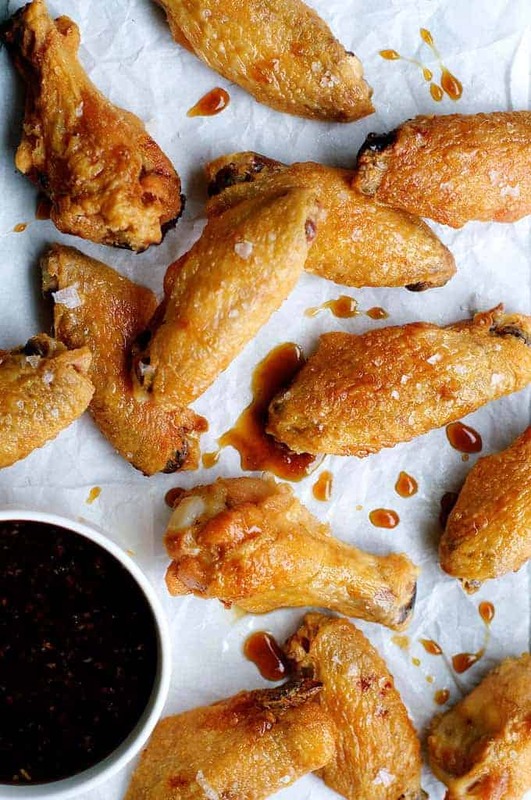 It wasn’t until I looked at a recipe that I realized wings don’t come pre-cut, and there is a science to getting that perfect “crisp” when baking them at home. Armed with this new knowledge, I set out to cut my wings into tips (which are discarded), drumettes, and whatever the other piece is called. And I learned something else: I am a lousy butcher. Cutting raw meat grosses me out, so I have not paid much attention to grain or cutting direction or the location of joints and ligaments. I just fumbled through the cutting step with my wings, which resulted in some blood (thankfully not mine, although the chicken blood was just as upsetting), and that made me even more uncomfortable with the whole process. If you are a chicken-wing-cutting novice like me, check out this quick video. I hope it might save someone the trouble and mental anguish I went through. I will share some hope: even though I butchered the butchering step, the blood did eventually go away, but next time I hope to avoid it altogether! Okay, on to the real “secrets.” The recipe I used is originally from Cook’s Illustrated, posted by Recipe Tin Eats with a sauce recipe of her own. It turns out that coating the wings in baking powder (I use a gluten free one by Ener-G) and baking them at a lower temperature/rack position before turning up the heat and raising the rack creates a just-like-fried crisp. The honey-garlic sauce was delicious, too. Served up with a heaping side of roasted veggies (green bean/sweet potato/carrot/radish), the meal was much healthier than the usual restaurant fare. This recipe is a keeper for sure! If you’ve been intimidated by wings in the past (or just uninformed) like I was, I hope you will be encouraged to go forth with confidence.